Family Adventures in the Canadian Rockies: Family Backpacking in Banff National Park - No Tent Required! Family Backpacking in Banff National Park - No Tent Required! Last month our family had an incredible opportunity to go backpacking in Banff without a tent or sleeping bags. We carried nothing other than our clothing, lunch for the first day and some emergency supplies such as peanut butter, candy, and snacks. Other than that, we had a couple of head lamps and Noah got to bring some toys, books, and his beloved Gymbo the clown. We also let Noah bring his old balance bike because we figured he could bike down the whole trail on the way home. We knew it would be too steep for him to bike up though and we definitely didn't want to carry his pedal bike 14km to camp. We started our journey to Brewster's Shadow Lake Lodge on the Red Earth Creek Trail which is a wide gravel and dirt path that was used as a backcountry service road many years ago. Now, the trail is used by mountain bikers, cross country skiers, and hikers looking to access Shadow Lake and the Bow Valley Highline Trail which runs all the way from Sunshine Village in Banff to Twin Lakes on the border with Kootenay National Park. The Red Earth Creek Trail isn't the most interesting trail in the Rockies but it provides the shortest and easiest way to get to Shadow Lake, our destination for the weekend. We hiked the old road for 11km to the junction with Pharaoh Creek and then continued a final 3km on a narrower trail to the lodge. We brought Noah's old (way too small) balance bike and my husband pushed him much of the way up the trail once we discovered that Noah's legs were actually too long to run with it uphill. Right, so that's why he has a pedal bike now! The reason we brought the bike - downhill sections were FAST! It took us 3 hours to travel along the 14km long trail to reach the Shadow Lake backcountry campground and lodge. We, lucky us, were staying in the lodge!! Shadow Lake Lodge - and our home for the weekend! Backpacking with a light day pack is a treat! On our trip into Shadow Lake Lodge, our son Noah carried some snacks, a water bottle, and... - that's about it. My pack was also incredibly light with our lunch, a couple bottles of water and more snacks. My husband's pack was the heaviest but that's only because we chose to bring luxury items like books, a portable DVD player for early morning wake up, and other items to occupy Noah who had no friends joining him on the trip. Without luxury items, my husband would have been carrying clothing and not much more. No Tents = Paradise for this Mama! Camping at the Shadow Lake Lodge made our trip so very much easier than if we had chosen to camp at the campground. After hiking in the rain to reach the lodge, we had a warm cabin to retreat to and hot drinks waiting for us. Tea Time! After hiking for 3 hours, we arrived at Shadow Lake in time for treats, fresh baking, appies, and goodies aplenty! And there "may" have been a bit of motivation in knowing that cookies were waiting at the end of the hike for Noah! Cozy evenings inside! One of my pet peeves when backpacking is having to go to bed at 8pm because it's cold and dark outside. At Shadow Lake Lodge, we could stay up late drinking wine and chatting with other guests in the warm fireside cabin. We even had live music one night provided by a visiting musician from Edmonton. All in all, it was a decadent weekend in the mountains and very different from last year's backpacking trip to Shadow Lake. Last year, we spent two days hiking through rain and snow with no reprieve at the end of the day. We ate freeze dried food under a tarp while sitting on logs, went to bed early, and woke up cold the next morning - just to hike through more rain and snow. It was a low point in backpacking history for me. This year however was a major high point! I confess that I was a bit worried before our trip and wasn't sure the whole experience would be very "family friendly." I imagined gourmet food with fancy French names I couldn't pronounce and I wondered what the other lodge guests would think of my boisterous and slightly spirited 5 year old. Most guests go to these places after all to get away from their kids. And most people don't bring the children with them on what would seem to be a perfect chance for a romantic weekend away. However, we are not most people and we wanted to go away as a family. Fortunately for us, Shadow Lake Lodge was completely family-friendly and we had no need to worry. What we discovered first was that the guests loved Noah, thought he was awesome for making it all the way in, and supported us for making the journey as a family. Noah even out-hiked most of the other guests at the lodge and was the only person (along with Mom and Dad) to actually climb a mountain during our stay. Second, we discovered that while the meals were very tasty and could easily have come out of a gourmet cookbook, Noah liked them. The pork loin even came with pasta! And breakfast came with pancakes on at least one of the mornings so what's not to like there for a 5 year old? We brought a fair bit of supplemental food with us - just in case, and found that we didn't need any of it. The only thing we did find useful to have with us was a jar of peanut butter for Noah's lunch sandwiches. Bring a balance bike for 2-4 year olds. We feared it could take us up to 6 hours to get in to the lodge at a hiking pace of 2.5 km per hour. Thanks to Noah's small bike, it only took us 3 hours to get there. And on the way out - 2 hours!! All downhill. Next time, we're all bringing our bikes. Just need to get gears on Noah's next bike. Bring a chariot or stroller for the first 11km of the trail. Then lock it up to the bike rack at the junction with Red Earth Creek and Pharaoh Creek. The trail is 100% Chariot-friendly up until this point. After this point, you still might be able to get your Chariot through with a bit of effort. It just gets really steep for a bit. But I imagine if you pulled it up backwards, (without kids inside) you could do it. As mentioned earlier, bring baby monitors if you want to retreat to the fireside cabin while kids are sleeping in the evening. Bring snacks and emergency food in case your child decides he or she doesn't like what's on the dinner menu. We brought peanut butter and cheerios which were both well appreciated by Noah over the course of the weekend. Bring "quiet time" activities for your child/children so that if you choose to hang out in the fireside cabin together as a family, your kid(s) won't be running around like crazy disturbing everybody. Fortunately, the lodge does have some children's games such as a beginner version of scrabble that we enjoyed. Read more about our adventures at Shadow Lake! Check out the recent story I just wrote, Magical Autumn Hiking on the Bow Valley Highline Trail. We had the most amazing day of hiking while staying at the lodge and I think you'll agree when you see the photos in the previous story. Hiking with younger kids? The Shadow Lake trail is a good choice and the lake can be reached in 0.5 km from the lodge. There's a bridge and it would be a great place to spend a few hours playing on the rocks. Want to Take Your Family to Shadow Lake Lodge? The lodge is just wrapping up its 2014 hiking season BUT you can start planning for next year and it's never too early to choose a weekend for your 2015 Shadow Lake Lodge trip and put it on the calendar. You can contact Shadow Lake Lodge as well to find out when you can begin making reservations for next summer. 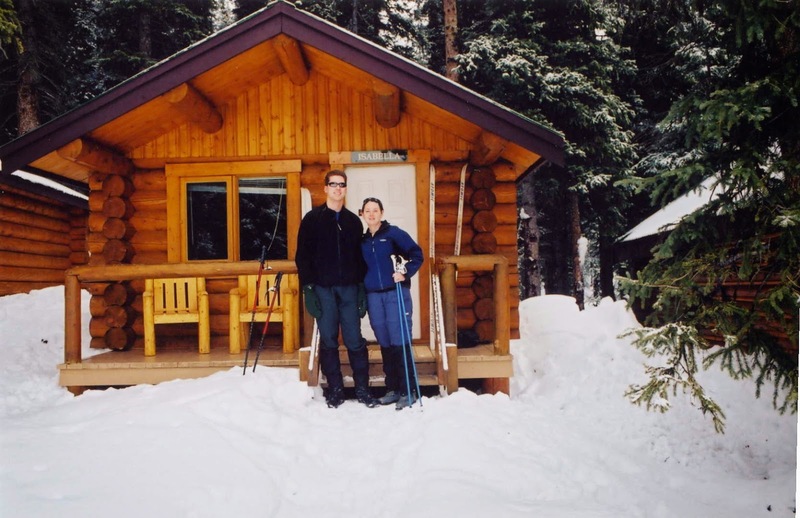 Our First Trip to Shadow Lake Lodge - MANY years ago. The lodge is also open in winter for cross country skiing and I can say from experience that it is amazing with snow! The Red Earth Creek Trail is an easy ski trail for novice to intermediate skiers and most of it would be chariot-friendly if you had a ski attachment. The final 3km has steep sections though and would have to be walked or negotiated more carefully. It's also more narrow so skiing it with a chariot would be trickier. Not impossible, just more challenging. Disclaimer: Our stay at Shadow Lake Lodge was graciously provided for by Brewster's in partnership with Banff Lake Louise Tourism. As always, all thoughts and opinions are my own and I wasn't compensated beyond the stay. Thanks for your post! This is the exact info that I was looking for. Trying to decide if we should do an adult only trip or bring our almost 5 year old. It's more "romantic" without kids - and relaxing! But it's easy enough to take kids. Makes for a nice comfortable backcountry trip.